We are going live with www.ResponsePointDealer.com. 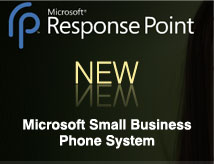 AMCC now offers an 'internet store' for the sale of Microsoft Response Point VOIP Small Business Telephone system and related components. We have been selling systems across the country for some time now - our new 'internet store' will make the sales process easier for us and for the customer. AMCC offers installation, configuration and training to customers in the Greater Cincinnati area. We partner with other Response Point Value Added Resellers across the country and can arrange onsite assistance in many markets around the country.